So, let’s talk about the roles that our gut and our gut bacteria play in our overall health. Then I’ll give you tips to improve your gut health naturally. The second main part of your gut are the billions of friendly health-promoting microbes. Gut microbes help us digest and absorb nutrients. They fight off disease-causing bacteria, produce some vitamins for us (like vitamin K and B), and have a lot more other health benefits, like mental health benefits, reducing inflammation, and stabilizing blood sugar. There are a lot of natural ways to improve gut health. Let’s start with what to stop. It’s always best to eliminate the cause. 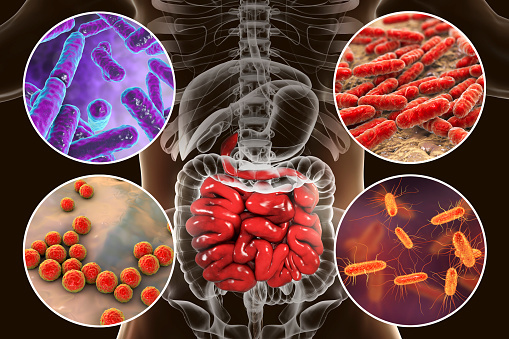 Eliminating added sugars, processed foods, and alcohol for a few weeks, will help restore the good bacteria in your gut and you may be amazed at how much better your body (and gut) feels. The second pillar of gut health is our gut bacteria. By ingesting probiotic-rich foods and drinks, we can help to replenish our gut microbes. These are found in fermented foods like kombucha, kefir, miso, sauerkraut, and kimchi. Make these a part of your daily diet. Whole foods are rich in gut-friendly fiber. Not eating enough fiber increases the risk of heart disease, cancer, diabetes, and obesity. Fiber plays lots of roles in our gut, including whisking away some of those pesky bad bacteria and toxins so they can be eliminated. Fiber also helps to feed our friendly resident microbes that help us absorb and digest our food better. What foods have a lot of fiber? Fruits, vegetables, nuts, seeds, and beans.